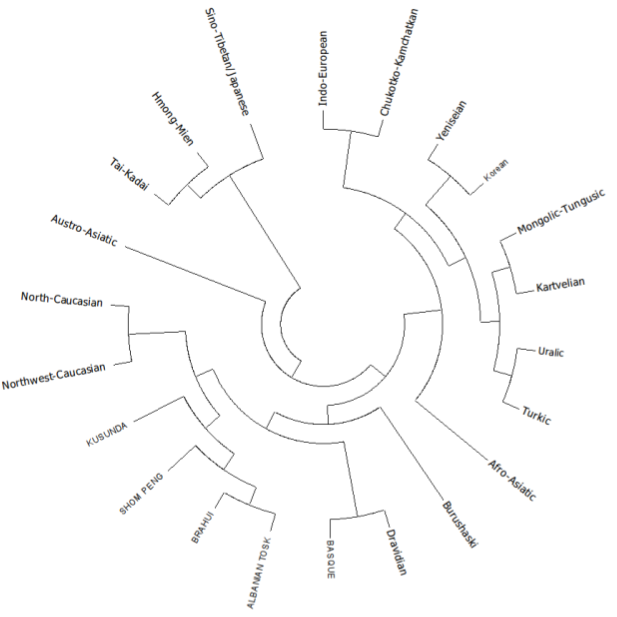 Gerhard Jäger uses lexostatistics to demonstrate that language similarities can be computed without using tree-based representations (for why this might be important, see Kevin’s post on reconstructing linguistic phylogenies). 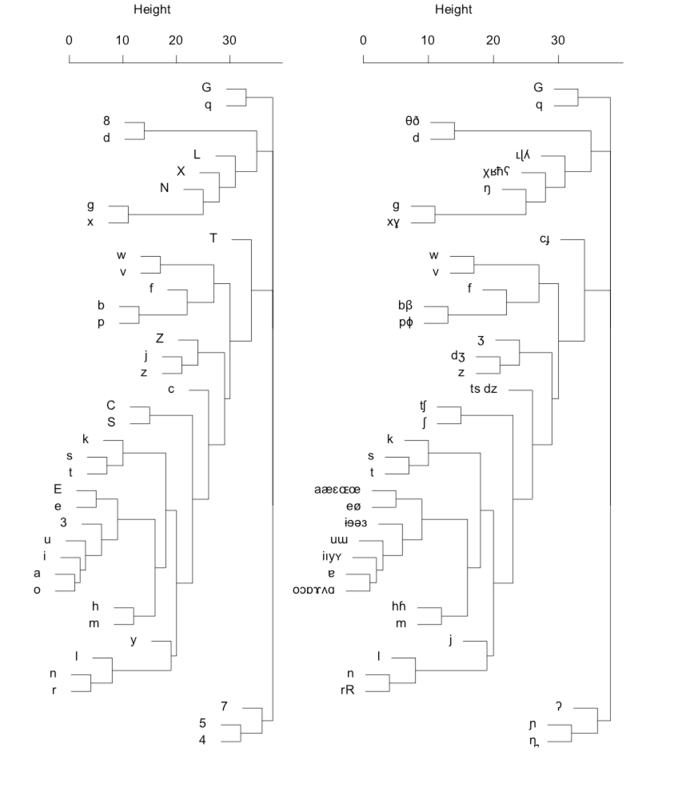 On the way, he automatically derives a tree of phoneme similarity directly from word lists. 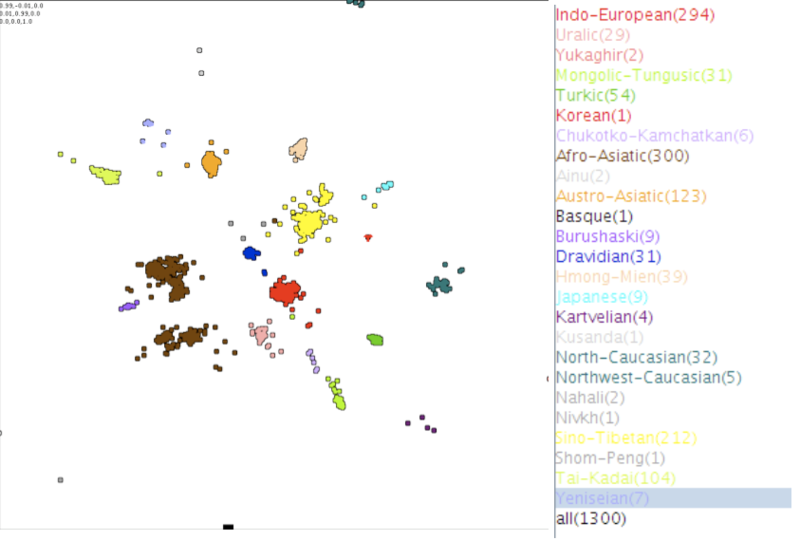 The result is an alternative and intuitive look at how languages are related (see graphs below). I review the method, then suggest one way it could get away from prior categorisations entirely. 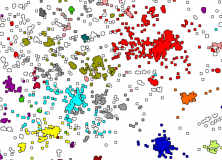 Jäger presented work at the workshop on Visualization of Linguistic Patterns and Uncovering Language History from Multilingual Resources at the recent EACL conference last month. He uses the Automated Similarity Judgment Program (ASJP) database, which contains 40 words from the Swadesh-list (universal concepts) for around 5800 languages (including Klingon!). The words are transcribed in the same coarse transcription. 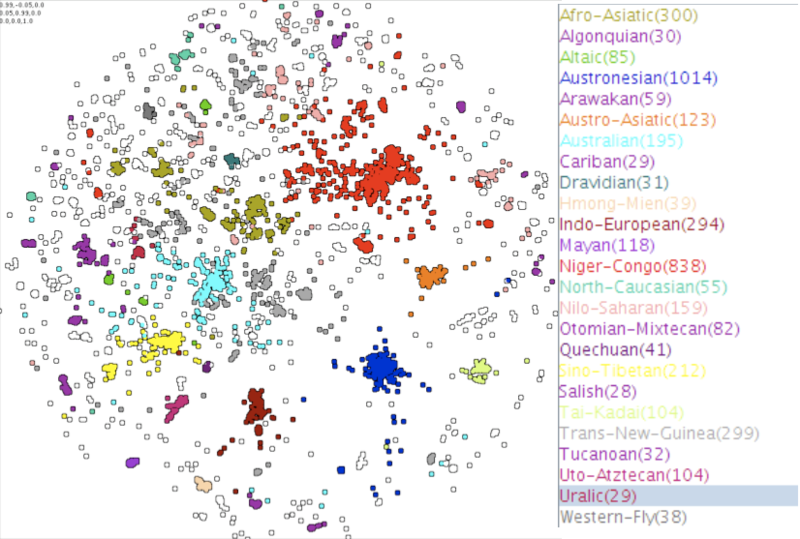 The task is to calculate the distance between languages based on these lists in a way that they reflect the genetic relationships between languages. The LDND distance measure is used as a starting point (Bakker et al. 2009): Given two languages, the distance between them is the average normalised Levenshtein distance between each word pair. That is, the average proportion of phonemes that need to be changed in order to transform a word in one language to a word in the other. The measure is further normalised by the average distance between all non-synonymous words from the two languages. This controls for the fact that if the two languages have large phoneme inventories with little overlap, the distance measure will be disproportionately high. Jäger improves this measure in two ways. First, the distance measure is unrealistic because it treats the distance between all phonemes as the same. Intuitively, the change between [hand] and [hent] is closer than [hand] and [mano], even though both paris differ in two phonemes. What is needed is a way to weight each phoneme change by its linguistic plausibility. For example, an [i] is more likely to change diachronically to a [j] than to a [k]. where p[ij] is the probability of amino acid i aligning with amino acid j and q[i] is the frequency of i.
Align the two words from each langauge that correspond to this meaning using a distance metric. 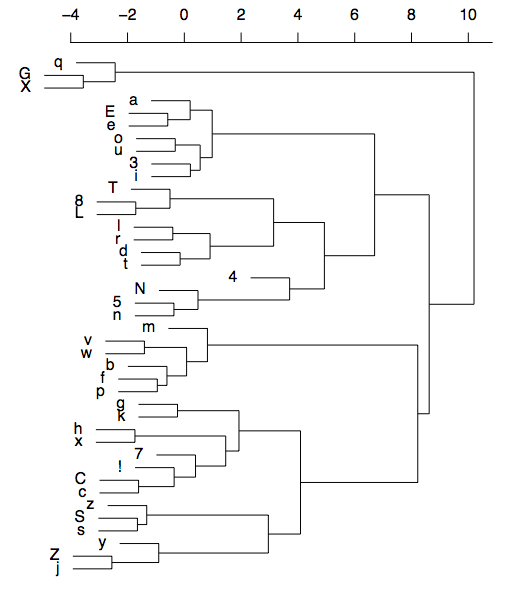 The results are phonetically plausible – the vowels are together and there are sensible clusterings such as S and tS, and the nasal cluster (N, 5 n) and so on. The frequencies can be translated into weights for use in the distance measures. The second improvement on the LDND measure is to take account of the variance in as well as the average of the distance between all non-synonymous word pairs. Jäger uses an information-theoretic approach to incorporate the variance. Essentially, this is the amount of information that you gain about a word by knowing its translation in another language (see page 4). Jäger then compares the different similarity measurements under this approach. Jäger’s algorithm using the Needleman-Wunsch distance metric performed better than when using the Levenshtein distance metric or the original LDND algorithm (although the effect size is small). Finally, the distances between languages were visualised using a force directed graph layout (using the free CLANS software). Basically, each language is represented by a particle in space that is attracted to similar languages and repelled by dissimilar languages. The CLANS program simulates the particles moving until they reach an equilibrium. The result is impressive, given that it’s a clustering of languages calculated directly from words which can be run on an ordinary laptop in a few hours. It’s easy to imagine extensions to this by adding more cultural variables or socio-economic data. It would be interesting to see how well the visualisation corresponded to a physical map of the world, perhaps by simulating the particles in an additional field with repelling areas representing the oceans. Pick a language pair with a probability inversely proportionate to the physical distance between them. I actually used the cubed inverse of the great arc distance in kilometers. It’s not clear whether this metric would work. Clearly, languages that are physically close should have a shared history, but the measure does not take into account physical barriers like oceans or flat, open ground compared to mountainous terrain. I tested this algorithm on Indo-European languages for 200,000 runs. Below are the results, displayed in the same format as Jäger (2012) on the left and the same tree with IPA symbols on the right (click for larger image). Although the results are somewhat different to that in Jäger (2012), they are also phonetically plausible. The vowels are together, there are clusters of dental, alveolar and bilabial phonemes and there are affricate-fricative pairs. It seems realistic, then, that this visualisation approach could work entirely without prior data on language classifications. I tried running it on the data for all languages, but with 6 million language pairs, my poor python script was too slow! Let me know if you’d like to see the code. First, between writing the paper and giving the talk, Jäger improved the method and compared this visualisation to some other methods such as Neighbour-Joining tree, multidimensional scaling and Principal components analysis. Some informative slides can be found here. Below are some of the alternative visualisations (click for larger image). Jäger points out that PCA is only really useful for the large language families, while CLANS is sensitive to local patterns. 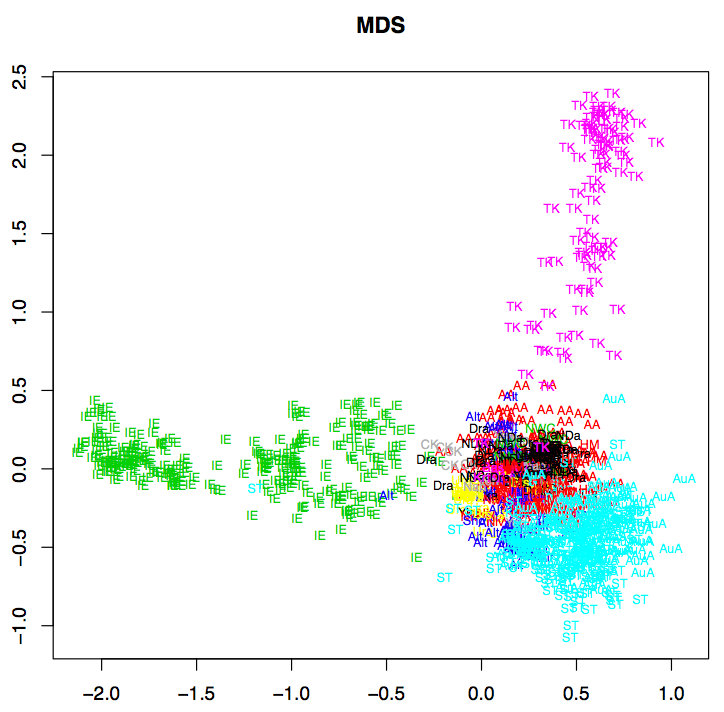 Also, Jäger took the phoneme distance measures produced by my variation of the algorithm above and computed the similarity matrix for Indo-European languages. 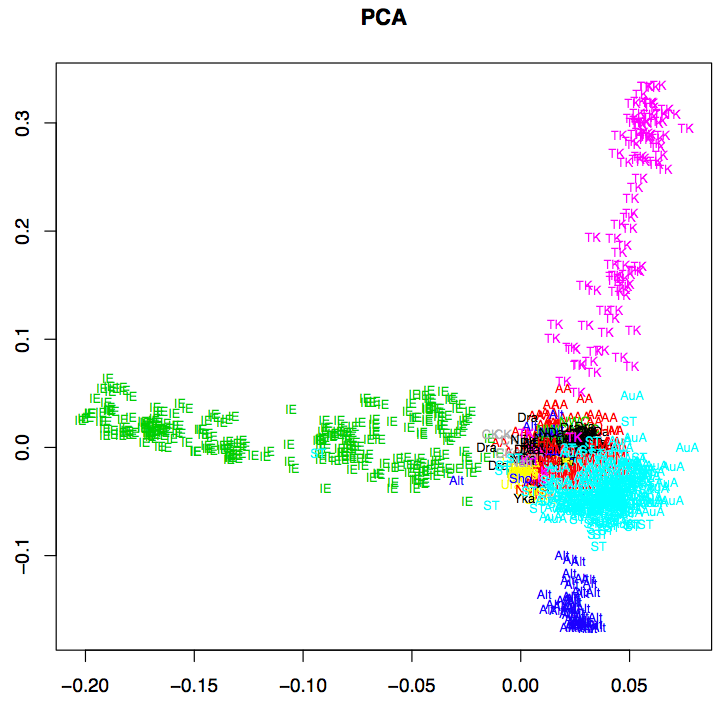 The Neighbor Joining tree computed from this has 51 false positives (17%), while the original algorithm produces 87 false positives. So, far from being a coarse approximation, the distance measure has actually improved the performance! The comparison is not entirely fair, however, since I ran my algorithm for twice as long as Jäger. Still, this is an interesting development. Jäger, G. (2012) Estimating and visualizing language similarities using weighted alignment and force-directed graph layout, to appear in Proceedings of LINGVIS & UNCLH, Workshop at EACL 2012, Avignon. Wichmann, Søren, André Müller, Viveka Velupillai, Annkathrin Wett, Cecil H. Brown, Zarina Molochieva, Julia Bishoffberger, Eric W. Holman, Sebastian Sauppe, Pamela Brown, Dik Bakker, Johann-Mattis List, Dmitry Egorov, Oleg Belyaev, Matthias Urban, Harald Hammarström, Agustina Carrizo, Robert Mailhammer, Helen Geyer, David Beck, Evgenia Korovina, Pattie Epps, Pilar Valenzuela, and Anthony Grant. (2012). The ASJP Database (version 15). First off, let me say I always love these posts about language evolution. My officemates are a bunch of sociolinguists, and what they’re interested in and what I–as a historical linguist–am interested in in terms of language evolution don’t always match up. And I am also really interested in these “non-traditional” approaches which can be used to supplement the Comparative Method. That being said, I would be a little cautious in using distance measures–like Levenshtein distance–to reconstruct a phylogenetic tree. Steel et al. (1988) give a (delightfully) brief overview, but basically, some information is lost and unrecoverable when using distance measures. Levenshtein distances in particular can be lossy (see Greenhill 2011). Your method, however, does seem to be a bit different–and distance measures are certainly still used in evolutionary biology, so it would be interesting to see how accurate and robust your method turns out to be. @Tom D: It’s true that compressing this amount of data into a 2d plot is going to involve some data loss, and I’m not discounting phylogenetic methods. However, phylogenetic methods do make different assumptions, and it’s healthy to get alternative ways of looking at languages. As you point out, we’re not all focusing on the same topics. However, I’ve been wondering recently if there is a common question, something like “How do variation, social structures and individual learning biases co-evolve?” (where co-evolve just means ‘change and interact’). This might work at the socio-linguistic level as well as for historical and evolutionary timescales. With regards to the robustness – see my update at the bottom of the post below. 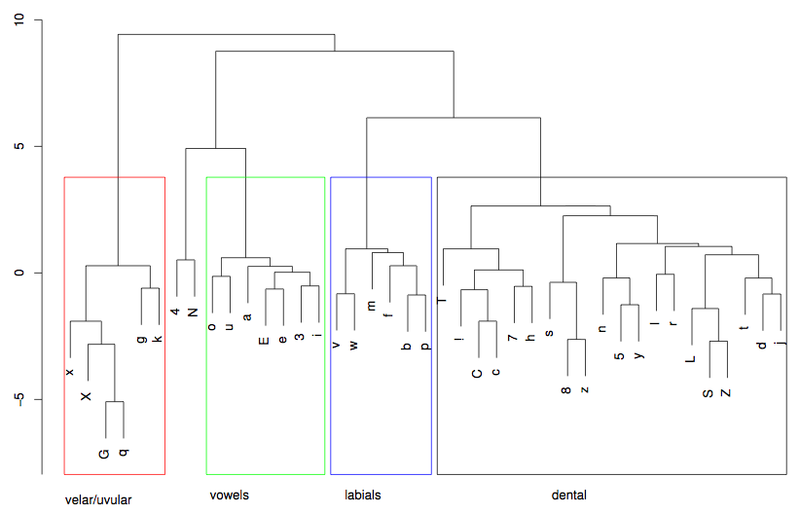 For another view of language relatedness based on words, see my old work on visualising etymologies. The Burushaski case, Dravidian case and the case of Japanese all suggest to me that loan words may be having a disproportionate influence on the apparent relatedness of the languages, which, of course, a non-tree-like methodology almost by its very nature, opens the door to. Burshaski may be borrowing from Pakistani Arabic, Dravidian from Sanskrit derived languages and Tibetan, and Japanese from its many Chinese loan words. Previous Previous post: What Does It Mean To Mean?